1. Who is considered the first guru of Sanatana Dharma? 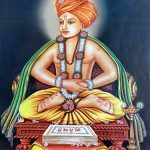 2. Who was Sri Adi Shankara’s guru? 3. Even the Lord, in His avataras as Rama and Krishna, learned under a Guru to show the importance of a Guru to the world. 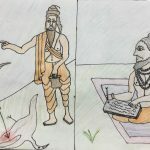 Who were the gurus of Rama and Krishna? 4. Who was King Parikshith’s guru, who narrated Srimad Bhagavatam to him? 5. Who is considered to be symbolic of the Guru in Ramayana—who brought the Lord to Sugreeva and Sita? 6. Who was the guru of Dhruva & Prahlada? 7. Who was Swami Vivekananda’s Guru? C. One who dispels darkness and bestows liberation.